A Canadian court case could lead to a Chinese national being deported to the US on industrial espionage charges. Meanwhile, the resolution of the US-China trade dispute may happen in a month. Canada is in a political struggle with China over the arrest of the Huawei executive, and up to three Canadian exporters of canola to China have had their permits to send to China suspended by Beijing. There is a chance that the loss of market for could last for a while as the dispute has been going on for a while now and no resolution seems to be in sight. The hearings on the case are underway in Canada now and the hearings and entire case have caused friction in the relationship between Canada and China. On the other hand, the US government has indicated a possible formal agreement with China within at least a month. The latest round of bilateral meeting between the US and China concluded last week. However, both sides appear satisfied with the progress on the talks and plan video conference calls to push forward on the agreement in the coming weeks. Winter wheat markets were higher last week, with SRW higher and HRW just slightly higher. Minneapolis was lower. Minneapolis moved to new recent lows on fears of a dramatic increase in planted area to spring wheat in Canada. Spring wheat prices have lost a lot and could go lower in the short term to price in the potential increase in planted area. On the other hand, some reports from Canada indicate that producers there would rather stick with the normal rotation rather than make any big changes in order to maximize yield potential now and over time. That implies that any switching of crops planted area might be minor. The US spring wheat planted area was projected to be significantly down in the coming year, but not enough to offset the potential increased area in Canada. Winter wheat prices are already low and producers who also run cattle in the Great Plains are reported to be grazing 3heat area instead of growing it for grain. Wheat export sales have been improved over the last month for the US as competing countries such as Russia run low on supplies and prices in general increase in world markets. It seems difficult to be very bearish at current prices in the Chicago markets. Minneapolis prices could move below $5.00 per bushel for a short time if the planted area in Canada does increase dramatically. USDA will issue its monthly supply and demand updates on Tuesday, and small increases in US and world ending stocks are expected by the trade. Corn was a little higher last week and remains in a trading range overall. The USDA quarterly stocks reports and prospective plantings reports and the bearish implications on supplies from both reports continued to overhang the markets. There are some ideas that the bearish news is now in the market and that bullish news could be coming. The actual supply of corn and feed grains, in general, might be a little less than indicated in the reports as a result of the massive flooding seen in the western Midwest and Great Plains this spring. The floods inundated many silos and elevators holding a lot of corn among other grains and oilseeds. There are still no overall loss estimates, but the losses could be rather significant. The weather in the Midwest this spring has been cold and wet and there has been little if any, fieldwork down. This could become a problem as there was very little fieldwork done last Fall. Farmers need all the time they can get to prepare the land for planting this year and so far they are not getting much time at all. Demand has held well, and hopes are that demand can increase with a new trade deal with China. In the meantime, President Trump threatened to close the border with Mexico but backed away from this position late last week. The US corn market needs that business with Mexico, our largest buyer. The US will have to leave the border open to promote this business. Ethanol demand should start to increase as the summer driving season gets underway. Many of the ethanol plants are in the western Midwest and were in the flooded areas, so it might take a while to get them up and running at full capacity again. Corn is normally trending higher at this time of year and could start to rally as most of the bad news for the market seems to be known. Speculators are very short, so it should not take too much bullish news to create the potential for a strong rally. USDA will issue its monthly supply and demand updates tomorrow, and US and world ending stocks of Corn are expected to increase to partially reflect the higher than expected stocks levels seen in the quarterly stocks in all positions reports. Soybeans and soybean meal were higher last week. USDA showed a strong weekly export sales report as recent sales of 1.7 million tons of soybeans to China were included in the data. Meanwhile, the Brazil harvest is at least 75 percent complete, and export competition from that country and Argentina is increasing. There are still bit supplies in the US as well, so the world will have plenty of offers to choose from. That makes it hard to look for major rallies in futures anytime soon unless the US weather remains bad. It has been wet and cool in the Midwest so far this spring, and any fieldwork has been next to impossible to do. For now, that implies that some projected corn area could get planted to soybeans, but it is also very possible that some ground will be allowed to go follow this year, especially in the flooded areas where more work will need to bring soils into condition for production. A large part of the projected increase in planted area for soybeans came from the Dakotas, and soybeans in this area mostly flow wet to the Pacific Northwest and to ports for loading to China. Not all of the area in these states will go to soybeans if there is no agreement, although the positive outlook on an agreement from both China and the US will help keep much of the area from getting planted to other crops. Demand from China in the coming year might be less due in large part to the Swine Fever epidemic in the hog herd in China. The country is already importing fewer soybeans due to less feed demand, and the trend should continue. The country will need to import pork for sale to the public and also hogs once the epidemic is under control to rebuild herds. Rice was lower for the week on follow through speculative selling. The selling came amid reports of weaker basis levels near the Mississippi River and high river levels making transportation down the river more difficult and expensive. Futures are now at about the midpoint of the trading range and should start to find increased buying interest. Demand remains generally good. Export sales have held together well, although USDA canceled a major sale to Mexico in the reports last week. No one in the trade thought that the reports were true, anyway, as there had been no announcements in the daily system and no activity that large reported in cash markets. Iraq bought 60,000 tons of rice from Brazil last week in an international tender. The US had hoped to be competitive for this business, but it looks like the recent weakness in the Real against the US Dollar was the bigger factor in causing the Brazil sale. Iraq has planned a tender for US rice for the next couple of weeks. Domestic demand is about average as mills continue to buy. Reports indicate that they are moving now for full coverage until the next harvest. Weather conditions have improved in Texas and near the Gulf Coast and planting and initial growth are reported. The big rains earlier in the spring made for good soil conditions for planting, but some areas are already turning dry. Some producers have had to flush the crops to get them germinated and growing. Planting and field preparations are being reported into Arkansas now as the weather has improved. USDA showed last week that planting progress was about on par with the five-year average, and producers are hopeful for good crops. Some storms moved through almost all of the growing areas over the weekend and field work will be halted for at least a few days now. It was a higher week for world vegetable oils markets. Palm oil was higher as March export demand was higher than trade expectations and higher on a daily rate basis than seen in February. Demand reports from the private surveyors had been showing that palm oil demand remained weaker for the month. There were some reports that production in Malaysia was holding better than expected. MPOB will release data later this week to show actual production levels. Production usually trends lower at this time of year due to seasonal factors, but reports from the country indicate that production has held closer to unchanged. Canola was slightly higher last week and is in a trading range as supplies in the country remain high and demand has softened. The market has tried to become more stable in recent weeks but faces strong headwinds in getting demand flowing again and avoiding big ending stocks. Worries that low production and low planted area this growing season have started to support new crop prices. Soybean oil was higher on mostly speculative and chart-based buying. It tested support near 2800 basis the nearest trading month and held, so the market moved to a short covering rally. US soybean oil faces increased competition in world markets from Argentina as its soybeans are harvested and processed. Argentina will look to reclaim its position as the largest exporter of soybean oil in the world. Cotton was higher again last week. Futures made new highs for the move and closed near those highs. The daily and weekly charts show that an uptrend has started. The weekly export sales report showed stronger demand for US Cotton and there is talk that the US can have strong sales with other major exporters starting to run low on supplies. USDA showed that planting progress was good. Most of the progress this week will be in Texas after some big rains were reported over the weekend in the Delta. The Southeast is also getting some big rains early this week. The futures market has absorbed a lot of bad news and is now working higher. The strong close on Friday implies that higher prices will be seen over the next few weeks. The daily charts imply that the market can move to or above 82.00 cents per pound. US sales have suffered so far this year in world markets, but have started to improve as other sellers run out of supplies. There are expectations that cotton planted area can increase this season as farmers could be attracted to cotton instead of grains such as corn due to relative pricing. Anecdotal reports imply that the industry is preparing for more production as new facilities such as gins are being opened. Cotton production is poised to make a comeback in the Delta and Southeast. FCOJ was lower again last week and trends are back down again. Speculators turned sellers after the recent short covering rally that had found new commercial selling. Ideas continue that production remains strong and demand does not. Inventories inside the state are significantly higher than a year ago. The oranges harvest remains active in Florida as the new crop begins to form. The early and mid harvest is over and producers are concentrating on harvesting Valencias. Fruit is forming and developing and ideas are that the next crop is off to a very good start. Irrigation is being used frequently to help protect crop condition Mostly good conditions are reported in Brazil. Futures were lower for the week and made new lows for the move in New York as weakness in the Brazilian Real caused some speculative selling. Prices closed lower for the week in London and trends have turned down in this market. The trade is still worried about big supplies, especially from Brazil and low demand. Brazil is dominating the market right now, and other exporters are having a lot of trouble finding buyers. For example, Honduras has cut its export projections by more than a million bags due to lack of buying interest in its coffee. It says that Brazil is selling at levels that are well below the costs of production in Central America. Honduras is the low-cost producer in Central America. The inventory data from ICO and others shows ample supplies in the world market. Brazil had a big production year for the current crop, but the next crop should be less as it is the off year for production. Ideas are that the current production of 62 or 63 or more million bags can become about 52 million bags next year. El Nino is fading but remains in the forecast, and coffee areas in Brazil could be affected by the drought that could hurt production even more. Mostly dry conditions are in the forecast for this week. Vietnam is active in its harvest, but producers are not willing to sell at current prices. Production in Vietnam is estimated less than 30 million bags due to uneven weather during the growing season. It is still dry, and production potential for the next crop is getting hurt. Even so, London moved lower last week on speculative and origin selling. Some follow through weakness is possible for both markets early this week. Futures closed higher. Chart patterns on the weekly charts are sideways in New York and sideways to down in London. The fundamentals still suggest big supplies, and the weather in Brazil has improved to support big production ideas. Reports that Brazilian mills might pause and give sugarcane production a chance to improve helped support the market. Brazil weather is improving in all areas as there is less rain in southern areas and more to the north. However, it has turned drier in northern areas and there is concern that the dry season is starting early this year. Brazil has been using a larger part of its sugarcane harvest to produce ethanol this year instead of sugar, but Thailand has shown increased production this year. 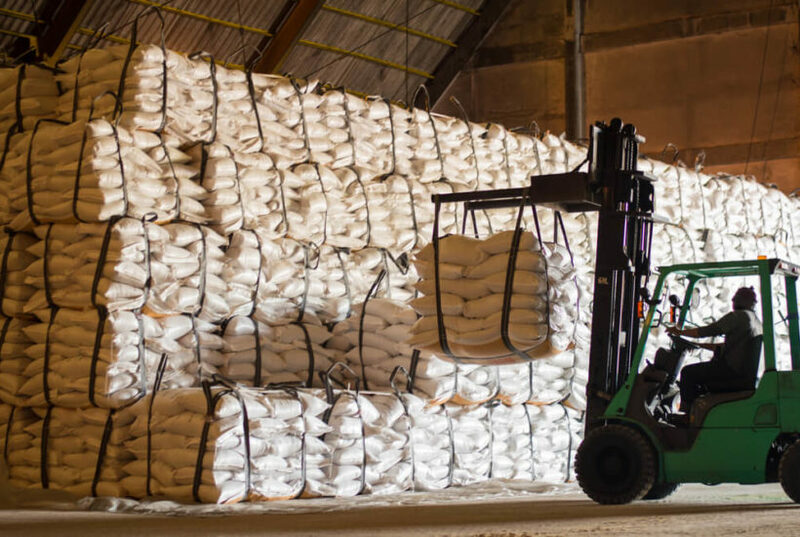 Ideas that production in India and Pakistan is being hurt by news that Indian mills are asking the government not to force them to sell sugar into a depressed world market in order to try to maintain some control over operating losses. Very good conditions are reported in Thailand. Futures closed higher in both markets. The main crop harvest should be about over and mid-crop harvest is still a month or more away. Ivory Coast arrivals are strong and so are exports. However, arrivals have started to fade. The weekly pace just a month or two ago was about 15 percent ahead of a year ago and now is under 10 percent of a year ago. Growing conditions are generally good in West Africa. Some early week showers and cooler temperatures were beneficial, and most in West Africa expect a very good mid-crop harvest. Cameroon and Nigeria are reporting less production and prices there are reported strong. Conditions appear good in East Africa and Asia, but East Africa has been a little dry as has Malaysia.